It’s a question I ask myself every day. 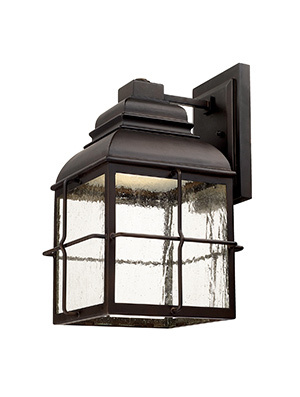 So many homeowners now use recessed lighting to light their front porch outside. No carriage lights on either side of the front door, no pendant centered on the porch. It looks… sad. What’s happening outside your home? First impressions matter and that first look at your house may be kind of dark and lonely. And what about you? Is your home welcoming you back after a long day? Does it delight you to see it beckoning as you come up the street? The good news is it’s easy to freshen up your home’s entrance. Here’s your guide to a welcoming look. Outdoor pendants and chandeliers make a wow statement. A unique fixture accentuates a beautiful front door. When you pull design elements from the lighting in your foyer to the exterior of your house, you instantly extend your living space. If a pendant isn’t in the plan, carriage lights on each side of the front door have a generous appeal. Hang them 6 feet from the ground to light the doorway. Oversized fixtures are on-trend. Gone are the tiny little black wrought iron “front lights” we had as kids. Today’s fixtures are big-hearted. Use LED bulbs and save on electricity. Just like every other light switch in your home, you can add a dimmer. Soft light outside is better. A note about security: leave the exterior lights on. It confuses the burglars!